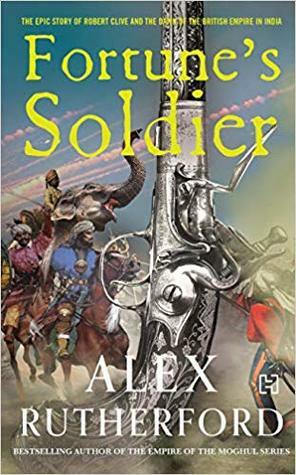 Nicholas Ballantyne was meant to enjoy his life in Glenmire, Scotland, but when an unprecedented move on his uncle’s part sends him across the world to Hindustan, he becomes deeply involved in the changing political scenario of the nation. As an employee of the Company, Nicholas ventures into the heart of its presidencies in Calcutta and Madras. It is there that he displays the true meaning of loyalty and humility, racing from one battlefield to the next, protecting those he loves and serving the Englishmen who’ve given him a chance to rebuild the name, Ballantyne. I enjoy reading historical fictions and this one features my homeland, so of-course I wasn’t going to pass it up. Moreover, it promised a great deal of adventure surrounding the operations of the East India Company in the 1700s. That is a subject I’m not very familiar with and so, I couldn’t wait to see how Alex Rutherford would combine this fictitious storyline with the recounting of events that actually happened in world history. What impressed me from the very beginning is the authors ability to characterize Nicholas in such a way that he becomes a full-fledged, realistic person, one who begins to surprise you with his strength of character. And I feel that it is this very quality about the writing style that prevented the entire tome from being dull. Even though we read about many battles and war council meetings, I wasn’t bored of it (barring the last couple of chapters) because I was fully invested in Nicholas’ as the lead. The writing style is not over the top and neither is it too simple or plain. It doesn’t make allusions to any event or occurrence in a way that leaves you perplexed or unable to proceed reading the book without a quick dash to Google. That was another aspect that made me the like the novel. Apart from Nicholas, I enjoyed reading about Tuhin Singh. He is a respectful steward and friend to Nicholas, often shown to be just as (if not more) brave and has strong opinions about the Company’s operations in Hindustan. He is not easily fooled or subjugated. I felt that Meena’s and Lucia’s characters were not explored enough. They could have played a more significant role. From the beginning, we know that Nicholas is going to be this heroic character, and so it is the stories of Robert Clive and George Braddock that introduce the themes of greed for power, communal rivalry, corruption, betrayal etc. This book also brings to light the opinions of several Mughal rulers towards Hindus. And so, religion is evidently a common symbol throughout. By the time I’d read past page number 350, I was getting worn out by the sheer quantity of battles that are spoken about in this book. That said, I appreciate the ease with which these stories are delivered to us. A majority of this book makes for a very immersive read which will surely have your rapt attention. Nicholas’ adventures were thrilling to read about! And so, I’d definitely urge you to give it a try, if you are interested in historical fictions. What do you get out of it? An insightful story about the East India Company’s interest in Hindustan and the resultant changing dynamics within the nation.